CHICAGO -- The Cubs made All-Star history by becoming just the second team ever to have its entire infield start an All-Star Game. Anthony Rizzo (first base), Ben Zobrist (second base), Addison Russell (shortstop) and Kris Bryant (third base) were elected to start next Tuesday's game in San Diego for the National League, becoming just the second foursome to accomplish that feat and first since the 1963 St. Louis Cardinals. "Organizationally, it speaks to what's been done here the last several years," Cubs manager Joe Maddon said. "I take zero credit for that. It's great scouting and development on the part of the Cubs." Maddon vowed to be watching the game as the four infielders will be joined in San Diego by outfielder Dexter Fowler, provided he's healthy enough, as he's on the disabled list with a hamstring injury. Also going from the Cubs are pitchers Jake Arrieta and Jon Lester. Lester was picked by NL manager Terry Collins, while Arrieta was chosen by his peers and is a candidate to start the game. "I've been through a lot," Arrieta, a first-time All-Star, said. "A lot of hard work started to pay off and my career has started to move in a positive direction over the past couple years. It's a byproduct of the hard work." While Rizzo was the overall votes leader in the NL, it is Bryant who leads the National League with 25 home runs, while Russell has 11 after hitting three over his past two games. "It's an honor, and to have a lot of my teammates there with me will make it even more fun," Bryant said. "Just having your teammates and friends there will make it more special. The nerves probably won't be there as much as last year. You just look around and it's a normal game." Zobrist had the narrowest margin of selection among the Cubs players, garnering only 88 more votes than runner-upDaniel Murphy of the Nationals, who still made the All-Star roster. The Cubs shot out to the best record in baseball, going 25-6 before their pace slowed recently. In many years, it has been a struggle to find one All-Star-worthy player from the much-maligned organization, but since team president Theo Epstein came aboard in 2011, the Cubs have rebuilt their farm system and are reaping the rewards. On Monday, they were the first team this season to start nine players who were 26 years old or younger. "The start to the season is the reason fans have noticed [us], but I think the assembly of players we have in here is an All-Star-caliber assembly," said Zobrist, now a two-time All-Star. While the Cubs dominate the NL roster, the Boston Red Sox placed an AL-best six players on the team, the most they have sent to an All-Star Game since also sending six to the 2011 game. Boston's delegation represents a cross-section of young and old, perennial All-Stars and surprising selections. Shortstop Xander Bogaerts and outfielders Jackie Bradley Jr. and Mookie Betts -- all of whom were voted by fans to start in their first All-Star appearances -- are among the best young players in the game. David Ortiz, the 40-year-old designated hitter who leads the majors in OPS and plans to retire at season's end, will start in his 10th All-Star Game. Pitching has been the Red Sox's biggest deficiency, yet knuckleballer Steven Wright (2.42 ERA in 16 starts) was selected by AL manager Ned Yost and closer Craig Kimbrel (2.53 ERA, 17 saves) was chosen in player balloting. Wright is an unlikely All-Star, having secured a spot in the starting rotation only after lefty Eduardo Rodriguez injured his knee in spring training. Kimbrel has been an All-Star in five of his six full big league seasons. The reigning World Series champion Kansas City Royals had four players selected to the team, led by catcher Salvador Perez, who was the AL's top vote-getter. He will be joined by teammates Eric Hosmer (first base) and relievers Wade Davis and Kelvin Herrera. While the NL infield is making history by all being from one team, the AL infield (and catcher Perez) is making its own mark in the All-Star Game record book. The AL's infield of Hosmer, Jose Altuve (Astros, 2B), Manny Machado (Orioles, 3B) and Bogaerts, with Perez at catcher, marks the first time an All-Star team has ever selected a starting infield and catcher who are all 26 years old or younger. The Red Sox could tie the Cubs with seven total All-Stars if second baseman Dustin Pedroia wins the AL's final man vote. Pedroia will be up against Detroit's Ian Kinsler, Tampa Bay's Evan Longoria, Toronto's Michael Saunders and Houston's George Springer for the final spot, which is voted on by fans. The National League's final five is a battle between San Francisco's Brandon Belt, Milwaukee's Ryan Braun, Arizona's Jake Lamb, Pittsburgh's Starling Marte and Colorado's Trevor Story. If Belt wins the fan vote, he'd be the fourth member of the Giants to make the All-Star team. Despite entering Tuesday night with a major league-best 53 wins, San Francisco has just three All-Star selections in catcher Buster Posey and pitchers Madison Bumgarner and Johnny Cueto. In an interesting quirk of the rosters, the NL team features nine starting pitchers among its 14 total hurlers, while the AL squad has just five starters among its complement of pitchers. Information from ESPN's Jesse Rogers and Scott Lauber contributed to this report. Kris Bryant and Anthony Rizzo join Baseball Tonight to talk about their selection to the All-Star Game. 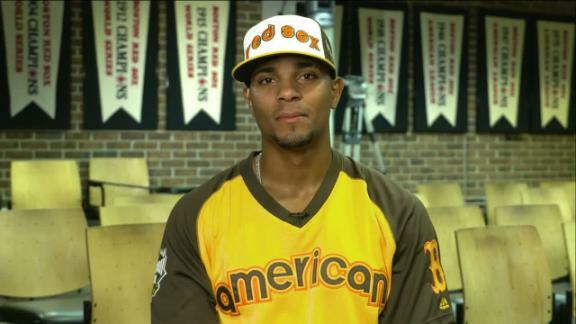 Red Sox shortstop Xander Bogaerts joins Baseball Tonight to discuss his All-Star selection and what he thinks it will be like for David Ortiz's final All-Star Game this season.